What truffles really are? Are they culinary diamonds, trapped in a body of an asymmetric tuber? Or they just want to look like diamonds in every way possible? One way or the other, tasting them is certainly an experience. A great number of erudite men were asked about the nature of this tuber, but after two thousand years of debates the answer is still the same: “We do not know.” And when asked about itself, the truffle says: “Taste me and you will be worshipping God,” as Alexandre Dumas wrote. It is common knowledge that truffles were already known around 1600 B.C. among many civilizations, from the Sumerians, Chinese and Babylonians to the Egyptians, Greek and Ancient Romans. These weird tubers had many different names throughout history. The Arabs named it ramek, tomer or kemas, the Greek idra, the Romans first called it tuber (from tumere – swollen, round) and then tartufo. The French truffe (forgery), the British truffle, the Germans call it truffel. Whatever name they had, truffles have a rich history, divided primarily between culinary art, culture and literature. This mysterious fruit had also inspired many poets. It was mentioned even by Shakespeare but became widely known after the publishing of Molière’s comedy Tartuffe. Rossini and Mozart enjoyed its fragrance too. Truffles have always been considered something special in culinary history, but they also triggered different opinions. Gastronomists worshipped them as the food of the Gods that inspires the soul and enlivens the body. On the contrary, mental hygienists showed hostility, considering them very harmful. Truffles were seen as an explicit symbol of depravity. Debates about what truffles in fact are were held among botanists, physicians and culinary professionals. In the Middle Ages the erudite were still arguing whether a truffle is an animal or a plant, as it definitely doesn’t look like neither of the two. It was only in the 16th century that the idea of truffles being of vegetal descent finally prevailed. It was thought that they are generated from juices flowing from the stem to the roots, where in times of storms, thunder and lightning, the truffles (or some kind of spherical roots) swell. In 1876 some botanist finally gained enough confidence to write in a science book that truffles belong to a species of bizarrely shaped subterranean mushrooms. Well…this statement is, in a botanical sense, still valid nowadays. Several dozens of truffle species have been discovered since then, and they are basically differentiated as black and white. The most famous white truffles in our region are Tuber magnatum, Tuber borchii and Tuber asa. Black truffles are divided in different species such as Tuber Aestivum Vitt,Tuber ubicatum, Tuber melanosporum and so on. The main components are water, proteins and elements: phosphorus, sodium, potassium, magnesium, calcium, sulfur and iron. They get the color, the taste and the smell from the tree they grow near to. Where do they grow? Truffles should be growing everywhere near the 45th parallel. They are gathered in Libya, occasionally in Kuwait, in certain regions in China, in Japan, in the USA they are picked mostly in Oregon however. In Europe, Italy is the most dug-up country, as they can be found in twelve regions. The most famous come from the region of Piedmont and Alba. They are searched for also in France, Spain, Germany(Brandenburg) and even in Serbia. In our immediate surroundings, they are gathered especially in Istria, both on the Slovenian and Croatian side. In Istria they grow in moist forests, in symbiosis with tree species such as oak, poplar, willow, hazel, basswood, hop-hornbeam and aspen. The black ones prefer swelling in alkaline ground (red, porous soil), while the white ones love acid ground (grey, clay, heavy soil). 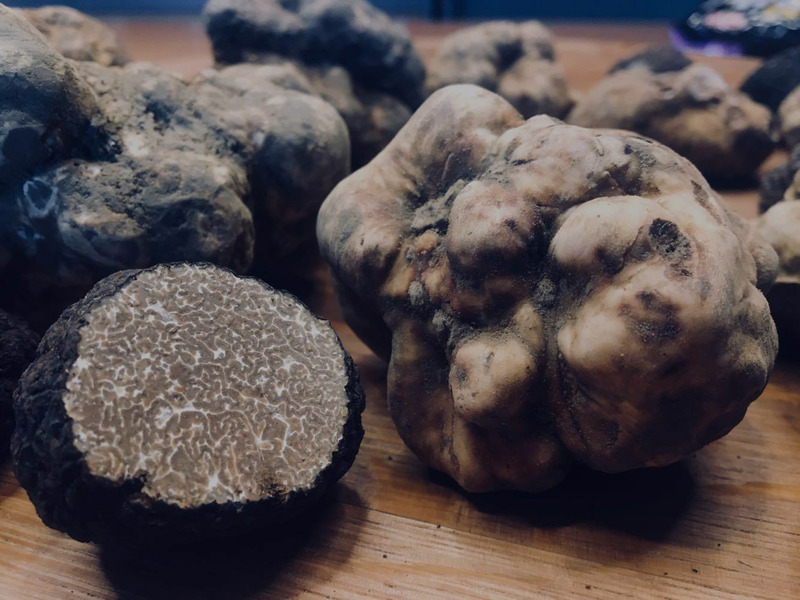 Experts pick truffles early in the morning when it is still cold and there is more humidity in the air, or also at duskfall. The majority of people prefer picking them just before dawn when it is still dark also because they don’t want to be seen, as good positions can be well kept family secrets. As man cannot detect truffles, special dogs that can smell them at a distance of 50 and more meters have been trained. The dogs’ training consists in adding truffles to their food since they’re puppies. By the way, the best dogs can cost as much as several thousands of Euros. Once all trufflers searched for treasures with pigs, nowadays pigs are used only in certain places in France. The trouble is that pigs prefer eating the truffles themselves. In the Slovenian part of Istria truffling isn’t as developed as on the Croatian side. Our trufflers gather only about 300 kilograms of truffles per year. Most of them end up on the Italian market, while some are destined to our restaurants too. Truffles are known as a natural aphrodisiac. Scientist couldn’t prove it but they admit truffles contain traces of substances that point at such stimulus. There is an opinion among the profane that states the tuber contains a wonder substance similar to the testosterone present in wild hogs during breeding.The female hog smells the scent, which makes her mellow. That should uncover all the mystery about its effects, how things develop from there on is obvious to everyone. By the way, truffles are supposedly adored also by Sharon Stone and Prince Charles of Wales. It is widely known that King Faruk had 5.000 wives, that’s why it wasn’t really a surprise when all his manly power disappeared. His embarrassment was resolved by some French herbsman who prescribed him truffles, and the king became king again overnight. Yet another story: Napoleon once lost his power too.